Bram Stoker's Dracula is the pin I have probably plyed the most in my lifetime. Working at a video store in the mid-nineties, we had a Mortal Kombat machine (later a MK2) and a Bram Stoker's Dracula pin. I played the hell out of MK and got very, very good at it as well as very, very good at MK2 to the point where I could head over to the local arcade and play on a quarter for the afternoon, playing the locals and chilling hard. 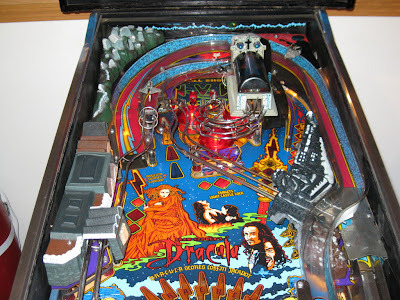 When I had no one to play against or got sick of playing through the game on one player, I would plays games of Dracula. It seemed to me to be a really hard game, very dark and lacked any sort of humour, unlike MK2 with its Friendships and Babalitys. I never was any good at it back in the day, eschweing rulesets for adreneline rushes of constantly firing flippers, but I did really like it and played a bunch of it. While I was watching the tutorials by Bowen on Tilt Warning, a tutorial came up for this and I watched the whole thing a few times in a row and saw almost everything that could be done in the game and just flipped. I started looking into what BSD's sold for and luckily, they tended to go rather cheap for 1990's DMD games - $1,500 being about average. I kept my eyes open for one locally and found one in Watertown, WI, about 2 1/2 hours away. I immediately jumped on it and started putting the money together. I picked it up a week after getting my Firepower and Paragon. 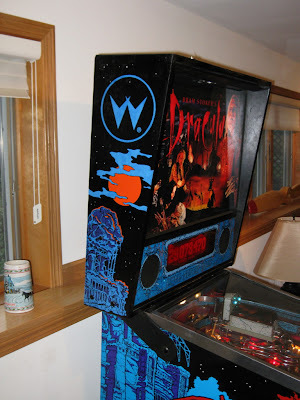 When I went to go see it, the seller was right up front with a bunch of small issues - like the playfield sliding rails being disconnected under the playfield and the touch-ups on the cabinet, which were actually very nicely done. The playfield is immaculate for the most part with no significant wear anywhere that I can find. 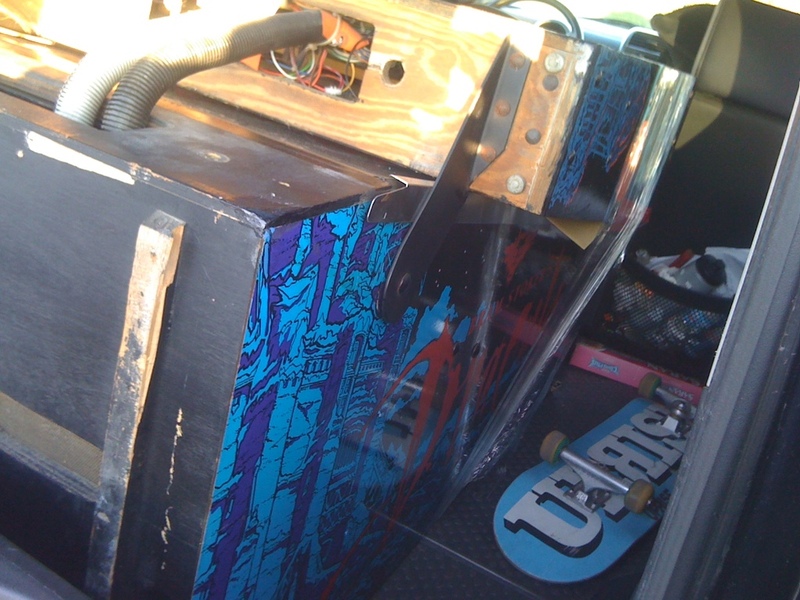 It has either been cleaned and waxed super regularly when on location or has a new playfield installed at some point. All the ramps are in perfect shape, with only two small guide plastics (one for the coffin ramp and one for the plunger) missing - which I have already cut out of acrylic and installed. The DMD is in perfect shape, the backbox is stellar and the GI - which I initially thought was dim - is totally fine. I took it home, set her up after having to call a friend in to help me get it up the stairs and checked it out in detail. 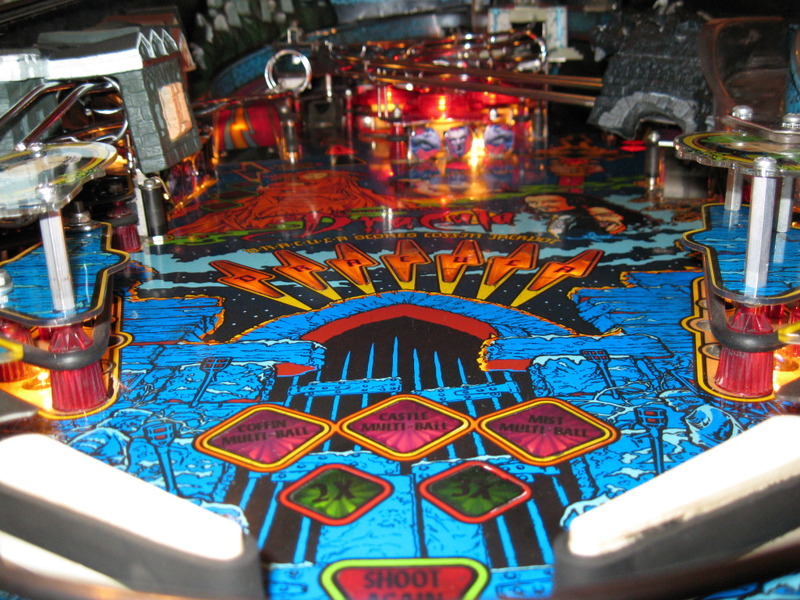 After playing a bunch of games, I found that the 10 opto board is probably on its way out and ordered a new one as it was firing the loop switch when I would plunge a ball. I tried cleaning the opto's for the Castle Lock and it didn't seem to change a thing, so I ordered a new opto board for it. One of the bumpers was a bit lethargic, so I made a few adjustments and its back to normal, but will probably need to be rebuilt at some point in the future. The rest of it is perfect. The gameplay is excellent and very rewarding with triple multi-ball being the goal to earn killer jackpots after locking two of the four balls and shooting the Jackpot scoop. 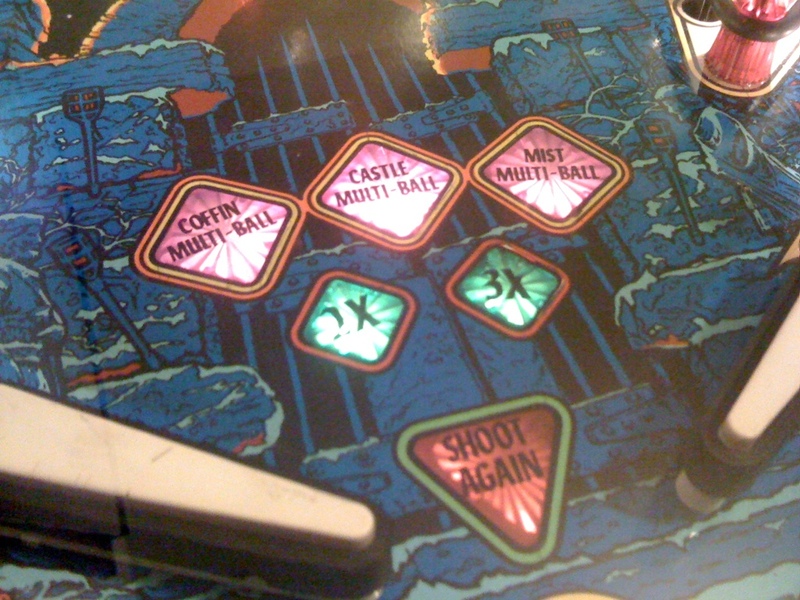 It also has the Mist multiball - a ball that travels across the playfield by a magnet underneath - which may be the coolest feature of any pin I have seen. The Coffin multiball is also stellar and features the best and most impressive animation in the game. 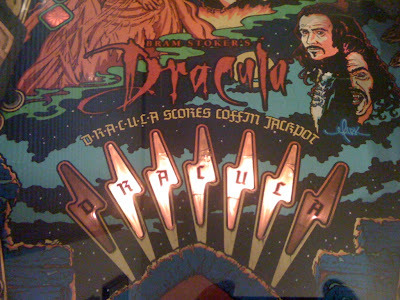 After starting Coffin multiball, you need to shoot the Coffin ramp enough times to spell DRACULA, with one letter awarded in single multiball play, two in double multiball play and three for triple multiball play. 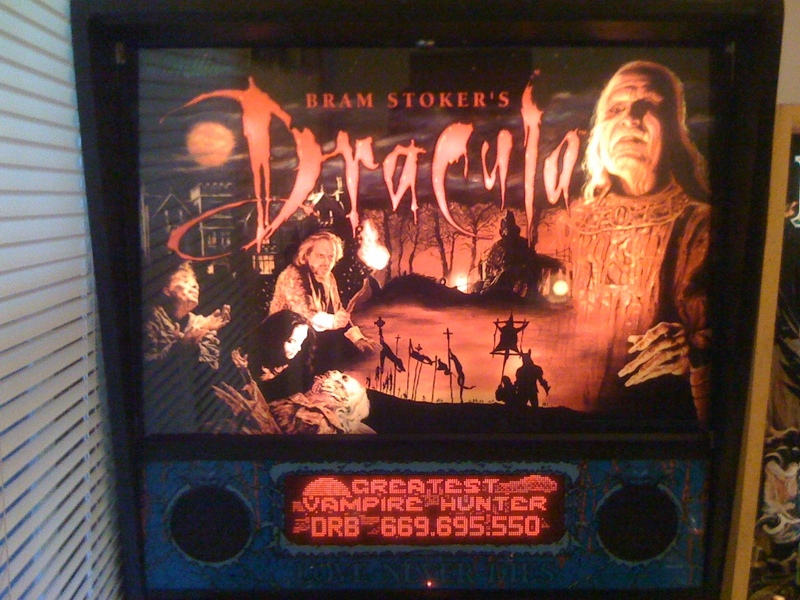 One you spell DRACULA, you actually kill him on the DMD, standing over his body, driving a stake through his heart and watching his face turn to a skull. The game volume gets louder when in multiball and the lightshow when you take out Dracula is amazing. I actually drained a ball the first time I did it because I was watching the animation so intently. The backbox and cabinet art is also amazing, though the backglass is just ok. 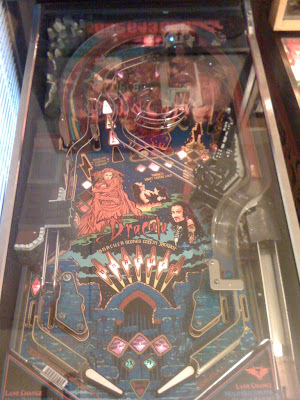 The cabinet and backbox ahave a screen of Dracula's castle with the Williams logo on the top of it - just killer stuff. The speech and DMD is very cool and it uses tons of speech samples from the game, featuring all of the main characters from the Francis Ford Copola movie, including Anthony Hopkins, Gary Oldman, Tom Waits, Winona Ryder and Neo. There's a lot of great quotes from Gary Oldman, including "Iam the monster that breathing men would kill" and "They say you are a man of good...taste." There's also a great quote from Anthony Hopkins as Van Helsing, which in the movie is somewhat humorous but comes off as super dark in the game, which is "I just want to cut off her head and take out her heart." Awesome stuff. I have been playing a ton of pinball at home for the last five days as Zespy is out of town and loving the selection I have put together. Officially, I now have a pin from each decade of the best years (in my mind) of pinball - 1970's, 1980's and 1990's. Grats on the beautiful pins! Thanks man - and yeah, it can be a bit tough on the back and neck if you play for like 10 hours at a stretch - which is exactly what I did today. 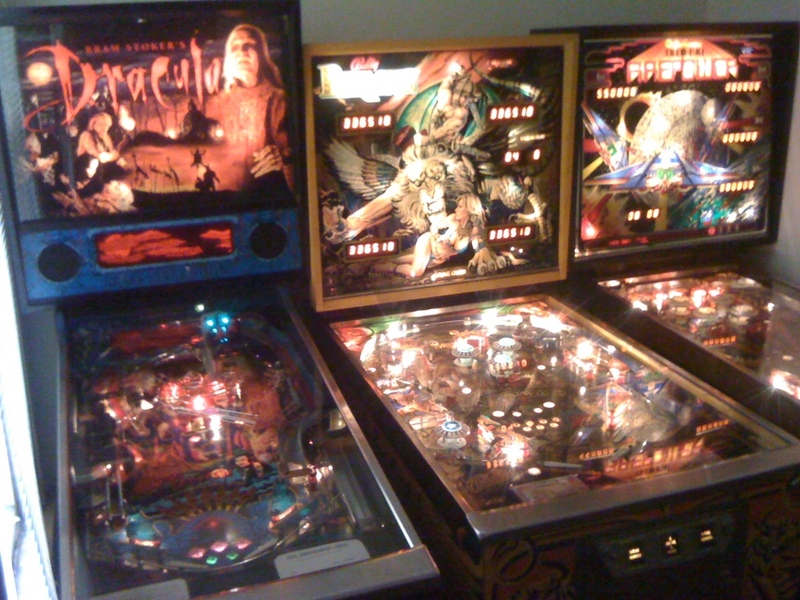 Pinball is just too damn fun. Played at home with my buddy Seth from 12 to 5 and then Zespy's place for another 4 hours and them back home again to play for another hour. My hands are sore, my neck is sore, but it was totally worth it. Congrats on the pins, boom. Insanely jealous, right here. The Firepower looks extremely nice, must have really taken care of it! Paragon is gorgeous! Artwork is, believe it or not, important to the attraction of the pin! Heh, I think brentsg was talking about not being home when you were ready to lug those bricks upstairs!!! Ha - yeah, they are pretty heavy. I'd make sure to get some good pain medication if you helped though, like Morphine. I look out for my friends! OMG, I've been away from your blog for a few months and now you have 3 pins? Damn! I have purposely stayed away from them for fear I'll catch the bug. They must be a pain to maintain. Glad you are having so much fun with them.